What are the advantages of LED over halogen? Are the LEDs in LED uplighters replaceable? How many lumens does a good LED uplighter produce? Do LED uplighters come with reading lamps? Can you change the luminous colour? Making things brighter: the uplighter should offer at least 800 lm, the reading light at least 400 lm. Never change a bulb again: Integrated LEDs can last up to 30 years or longer when used for 4 hours a day. LED instead of halogen: LEDs save 60% more energy, and therefore money. This protects your wallet as well as the environment. Enjoy lighting convenience: look for a built-in dimmer to easily adjust the brightness using a dial on the frame of the light. See our Guide for lots more information on LED uplighters. Where durability and energy efficiency are concerned, classic halogen uplighters just cannot compete with LED uplighters. LED uplighters have evolved so much that conventional bulbs just cannot keep up. This includes developments such as smart home variants, which make it possible to use your smartphone or voice control to control the light’s various features, for example, changing the colour or programming a lighting schedule. Most of our LED uplighters have fixed LED boards. Due to their long service life, however, you will never have to replace the LEDs in these products. If you use them for 4 hours a day, they can last up to 30 years or longer. You are likely to have bought a new light long before the integrated LEDs stop working. 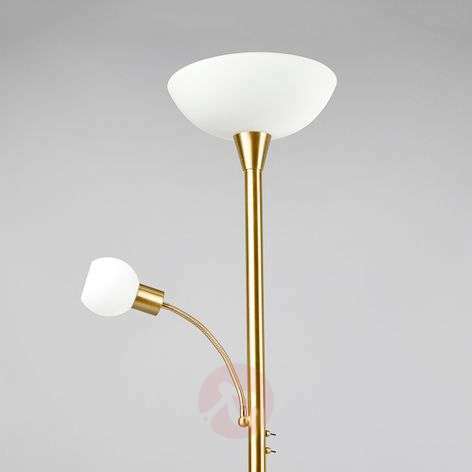 On our website, you can also find “classic” uplighters with sockets under the category "LED uplighters", which we deliver along with the LED bulbs. For example, high-quality Easydim LED bulbs with E27 sockets. Of course, you can replace these bulbs. You will find information on whether the bulbs are replaceable on the uplighter's energy efficiency label. The phrase “The LED bulbs in this light cannot be replaced” indicates that the product includes permanently installed LEDs that do not need to be replaced. A good standard is: 800 lumens for the uplighter and another 400 lumens for the integrated reading light. 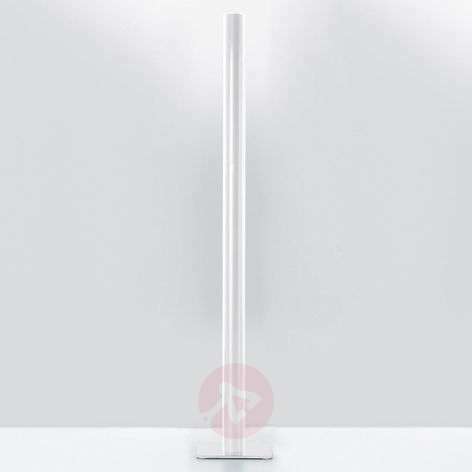 An LED uplighter with 800 lumens uses about 9 watts of energy and 5 watts for the 400 lumen reading lamp. In comparison, a traditional light bulb would use 100 watts for this amount of light output - a great advantage in terms of savings. High-quality LED uplighters sometimes produce even more lumens. 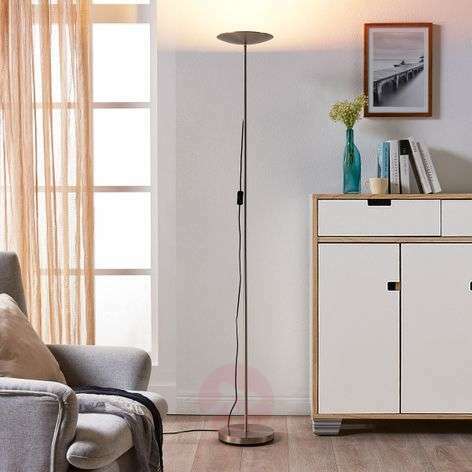 The brightness of these lights is typically adjustable using an integrated dimmer, so that you can get the right lighting for every situation – whether you want to read a book or have a snooze. Yes, many of them do. 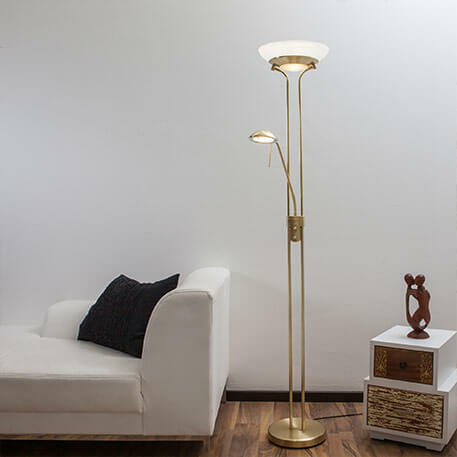 Reading lamps have long been considered important when it comes to comfort and convenience in your living space. 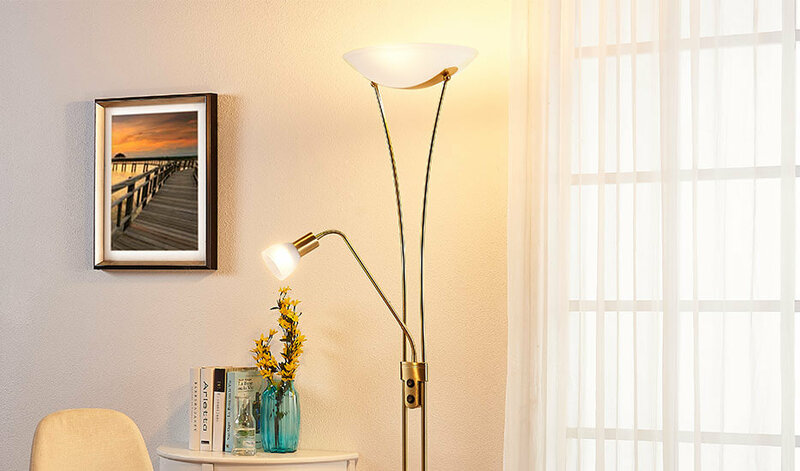 Uplighters offer a great combination of indirect light from the “shell-like” lamp head, plus direct light from the reading lamp. 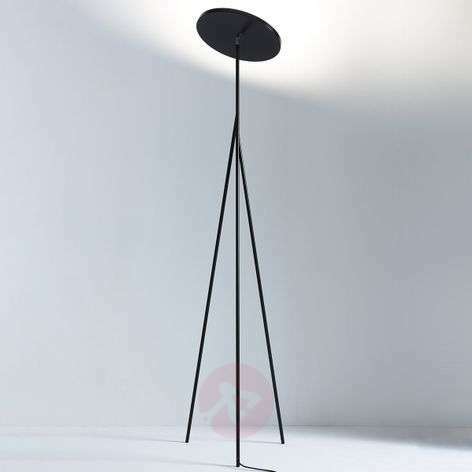 The lamp head takes care of the general lighting in the room, as the beam that shines up onto the ceiling is reflected back out into the room, creating glare-free lighting. The reading light, however, provides just the right amount of targeted area lighting for tasks that require concentration, such as reading a newspaper or crocheting. Can’t live without one of those practical brightness-adjusting knobs on your light’s stand? Want to be able to adjust the uplighter and reading light separately? We don’t blame you – every LED uplighter should have these convenient features. When reading the product details on our website, simply look out for the phrase “Dimmer: Included”. When this is listed, the LED uplighter can be easily dimmed without the purchase of external accessories. It should be noted, however, that the LED lighting technology works and dims a bit differently to classic halogen bulbs. This is why not all of our products have a dimmer or can be dimmed (even with external dimmers). If in doubt, please ask one of our specialists for advice. Our contact details can be found below. A lot is possible with the lighting technology available today – for example, seamless colour changes from red to green to blue, or from a cosy warm white to a cool white. For LED uplighters, however, these types of changes are more of a special feature than a standard. A tip for those who want to get more out of their light: all leading smart home lighting manufacturers also include smart LED uplighters in their range. One example is the ZigBee controllable Q Smart Home Lights by Paul Neuhaus. The built-in bulbs can be easily operated using your smartphone and offer countless options, from colour change to programmable lighting schedules. You can find products like these under the category Smart Home Lighting. As a rule, LED uplighters have a fixed height. Please note the height listed in the product details on our website and pick the right product for the size of your room. The reading light, however, is adjustable on most uplighters. This can be adjusted to the desired position at any time using a flexible arm. 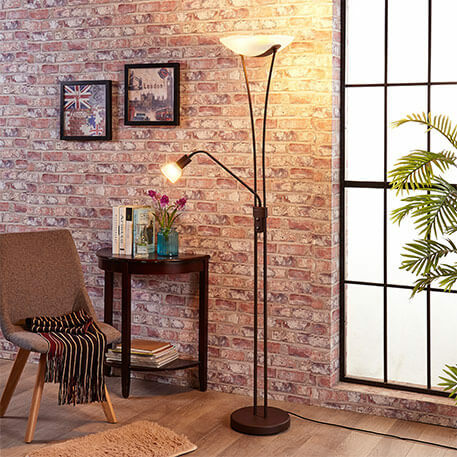 So you will no longer have to move your newspaper around in an attempt to find the perfect lighting – simply adjust the light itself. And let’s face it: that’s what lighting convenience is all about. Got any questions about a specific product or LED uplighters in general? Please feel free to contact one of our specialists. You can reach our specialist by phone on +353 1 699 2138 or via our contact form. We look forward to hearing from you.